When Pope Francis visited the White House last week, he said that “Climate change is a problem which can no longer be left to a future generation,” a timely and important observation with the Paris climate conference now just two months away. Developments over the last week reflect the Pope’s inspiring sentiment. Never before has there been so much momentum to tackle the global climate challenge. On Monday, Brazil became the first major developing country to commit to an absolute emissions reduction target by 2030, with its pledge to reduce emissions 37 percent below 2005 levels by 2025. This pledge builds on the U.S.-Brazil joint statement from President Rousseff’s trip to D.C. in June and includes an ambitious goal to deploy renewables beyond hydropower. Over the course of the week, more than sixty countries submitted their plans to the UN, including small and island nations that put forward specific years by which they would achieve greenhouse gas emissions targets. For example, the Maldives committed to reducing its emissions by 10 percent relative to business as usual by 2030, Djibouti committed to reduce its emissions by 40 percent on that same time frame, and Grenada committed to reduce its emissions by 30 percent relative to 2010 levels by 2025. And yesterday, India submitted its plan, announcing that by 2030, about 40 percent of its electricity will come from renewable sources like solar and wind, compared to about 15 percent today. As of today, more than 140 countries have submitted their plans, representing 84 percent of emissions from the energy sector. This number includes all of the world’s major emitters, from the U.S. and China to the European Union and India, to South Africa and Mexico. This progress over the past week reaffirms that all countries can grow their economies and reduce poverty, while simultaneously leaving a cleaner and safer planet for their citizens. This progress also shows that by developing plans and setting targets, this process builds momentum for concrete climate action. It was just 10 months ago that President Obama and President Xi stood together in Beijing and made an historic announcement setting respective climate targets for their countries. Now 10 months later, the U.S. and China have come together again to demonstrate to the world our commitment to accelerate actions to meet them. 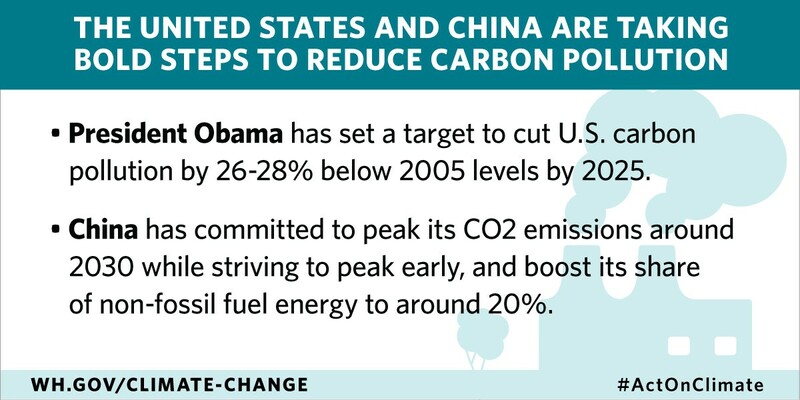 As President Obama finalized the historic Clean Power Plan, China has outlined its national cap-and-trade program covering its largest sectors by 2017, as well as its “green dispatch” system to favor cleaner energy and efficiency over coal in the electric grid — a critical step since China currently wastes over 10 percent of its renewable power every year because of dispatching decisions that favor coal. Both countries also agreed to finalize new fuel economy standards for heavy duty vehicles in 2016. Our countries broke new ground on climate finance to help developing countries deploy more clean energy and prepare for the impacts of climate change. Following the U.S. $3 billion pledge to the Green Climate Fund last year, China made a new climate finance commitment of about $3 billion to help developing countries combat climate change. The two leaders also articulated a common vision for the Paris agreement, including strong transparency provisions and increasing ambition over the long term. In other words, the agreement should encourage countries to put forward increasingly ambitious goals to reduce emissions and implement policies to meet those goals. These developments also show that when the U.S. leads on climate change, it inspires more action. For too long, opponents of climate change have hid behind the argument that the U.S. cannot afford to cut carbon pollution because other countries won’t follow suit. But when President Xi stood with President Obama in the Rose Garden on Friday, when President Rousseff spoke before the United Nations on Monday and when countless other leaders committed to take bold action on climate change, it became abundantly clear that the people of the world join the American people in their commitment to tackling this global challenge. In short, it’s been a big week for our global efforts to combat climate change. To quote President Obama during his trip to Alaska last month, “there is such a thing as being too late. And we must do more and move faster for the sake of the only planet we have.” Together with actions taken earlier this year, the events of the last week demonstrate important momentum in the global fight against climate change. We have to keep it going.